Faculty, staff, and students from the college learned about ways to increase diversity and inclusion during the Nov. 12-13 visit with Edward Romero. 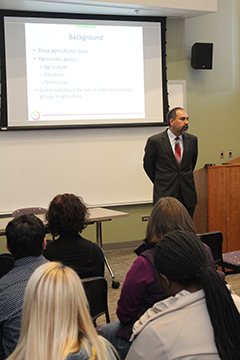 Romero gave a presentation entitled “Strategies for Recruitment and Retention of Underrepresented Populations in Agriculture” and met with several groups during his visit. 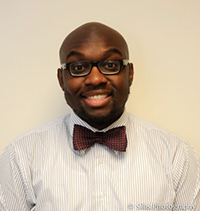 He shared his insights to help bolster efforts and plans for improved diversity and inclusion. This presentation was sponsored by the CALS Diversity Incentive Fund. Eric Kaufman submitted the winning proposal to bring Romero to campus. “Having a larger pool of highly diverse students in the agricultural, food, and life sciences arena will translate into a more dynamic and vibrant agricultural industry that is better equipped to serve the changing demographics in the U.S.,” Romero said. Romero is currently the chief diversity officer at Texas A&M University-Commerce, where he is responsible for the development of designing, coordinating, implementing, and enhancing all diversity and inclusion efforts of the university and works collaboratively with the senior management team, colleges, departments, offices, groups, and individuals across the university. On Nov. 13, the College of Agriculture and Life Sciences Diversity Council will host Edward Romero for a discussion of the recruitment and retention of underrepresented populations. In 2009, Romero formed AgForLife LLC to help address the lack of students majoring in agricultural and life sciences, particularly from underrepresented populations. Romero is currently the chief diversity officer at Texas A&M University-Commerce, where he is responsible for the development of designing, coordinating, implementing, and enhancing all diversity and inclusion efforts of the university and works collaboratively with the senior management team, colleges, departments, offices, groups, and individuals. During his visit to Virginia Tech, Romero will share his insight and help bolster efforts and plans for improved diversity and inclusion. Everyone is welcome to attend the open seminar at 10:30 a.m. on Nov. 13 in the Human and Agricultural Biosciences Building 1, seminar room 108. For more information on his visit, contact Eric Kaufman at 540-231-6258. The Oct. 7 College Diversity Showcase that was organized by the College Diversity Council was a huge success, with more than 100 students and faculty and staff members in attendance. 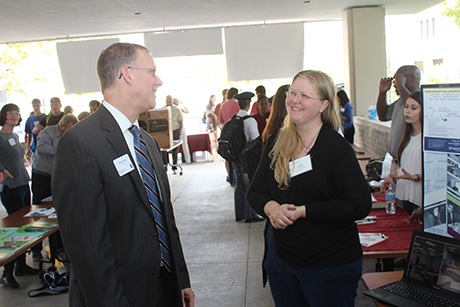 Dean Alan Grant was among the more than 100 people who attended the College Diversity Showcase. About 15 clubs and organizations from across the university set up displays in front of Litton-Reaves Hall to share information about their groups and celebrate the many ways the college provides academic and professional environments that support multicultural awareness, acceptance, and inclusion. More than 15 clubs and groups were at the event to highlight the work they do to promote diversity and inclusion. Activities included a spin-the-wheel trivia game where prizes were given away for correct answers about the history of diversity in the university. A large world map allowed people to place pins on their hometowns. 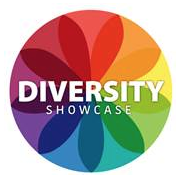 The College of Agriculture and Life Sciences Diversity Council is planning a College Diversity Showcase on Wednesday, Oct. 7, 3 – 5 p.m., at Litton-Reaves Hall. As part of this event we invite faculty, staff, and students of the college and Virginia Cooperative Extension to join us as we celebrate the many ways we strive to provide academic and professional environments that support multicultural awareness, acceptance, and inclusion. We envision the afternoon to be one of sharing ideas and experiences in a casual and safe environment. Examples of work on behalf of diversity to share are: research related to diversity, inclusive pedagogy, community service, diversity training opportunities, etc. Refreshments will be served and fun, interactive activities will provide opportunities for building community. Please reach out to any member of our planning committee should you have questions or concerns. Eric Kaufman, associate professor in the Department of Agricultural, Leadership, and Community Education, was awarded the 2015 Diversity Incentive Fund for his proposal to bring a visiting scholar to campus to talk about diversity and inclusion initiatives. The $2,000 CALS Diversity Incentive Fund is specifically designed to provide support for new, innovative, and creative approaches to raise awareness, engage learners, and change behaviors about diversity and inclusion within the academic community as well as the broader communities that the college serves. Kaufman is going to bring Edward Romero, the chief diversity officer from Texas A&M University, Commerce, to campus for discussions with administrators, faculty, and students about recruitment and retention of underrepresented students. Romero has a background in development of underrepresented populations in agriculture and improving the leadership of Hispanics in agriculture. Participants in the Diversity Development Institute are able to take classes on diversity and inclusion with the ultimate goal of obtaining a Diversity Ally certificate. 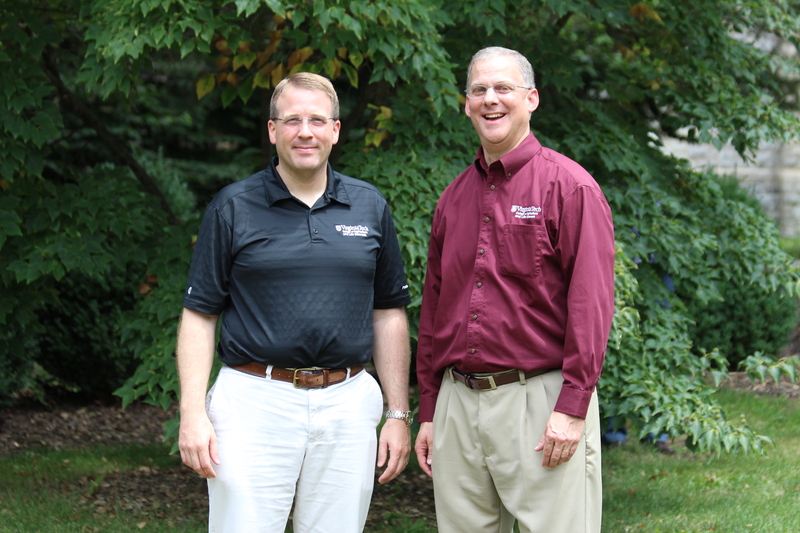 Mike Akers, head of the Department of Dairy Science, Stephen Kleiber, director of finance, and Erik Ervin, assistant dean of academic programs, were among the members of college leadership team to take diversity-training classes recently. As part of the college’s commitment to the university’s InclusiveVT initiative, leaders from around the college are taking a series of classes on diversity and inclusion with the ultimate goal of obtaining a Diversity Ally certificate. 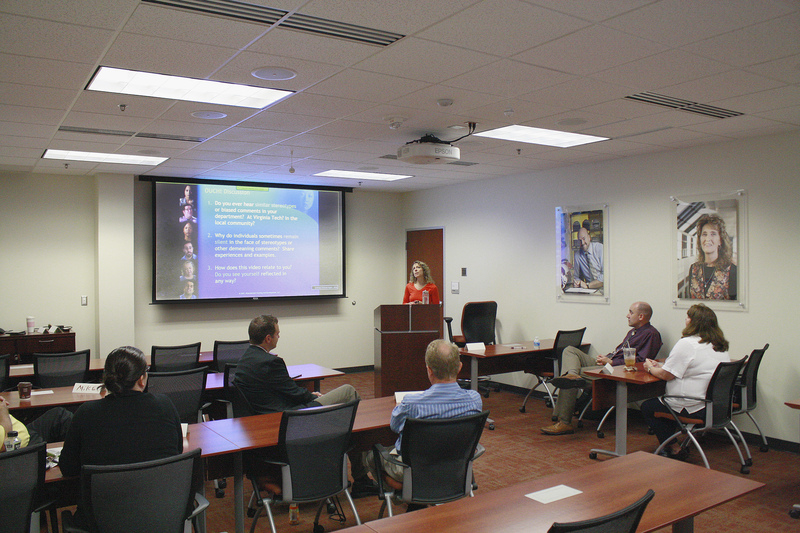 Associate deans, department heads, AREC directors, unit directors, associate directors, and others are all undergoing the training, which takes six classes to complete the certification. Leaders are then expected to share the class experience with their colleagues and engage in conversations about diversity and inclusion within their departments. Everyone is encouraged to sign up for free courses on diversity and inclusion through the Diversity Development Institute. The college has made a commitment to diversity and has four initiatives to enhance this mission, including leadership training and communication; civil rights training and compliance; inclusive teaching practices; and VCE Diversity and Inclusion fellows. To learn more about the work the college’s Diversity Council is doing and how you can get involved, visit the group’s website. The attached spreadsheet shows the 2007 and 2012 statewide data by commodity area for women and minority principal farm operators. The data came from the U.S. Agriculture Census. This information should be useful as agents, specialists, and AREC advisory groups think about who makes up their potential audiences. Same with women vegetable farmers. Increases in women operators also occurred between 2007 and 2012 in fruit farming, ornamentals, nursery and floriculture production, cotton, hay, sheep and goat production, and aquaculture. The total number of Virginia tobacco farmers dropped between 2007 and 2012, but the number of minority tobacco produces stayed steady. The number of minority producers of ornamentals, nursery, and floriculture crops doubled between 2007 and 2012. Contact Joe Hunnings if you have questions about this data or how to use it in your program planning. Three individuals from the Virginia Tech College of Agriculture and Life Sciences and Virginia Cooperative Extension were recently recognized with the Diversity Enhancement Award for their commitment to promoting diversity within the college and the commonwealth. The College Diversity Council honored Leemar Thorpe, project associate with the Virginia Tech Post-Baccalaureate Research and Education Program and the Virginia Tech Initiative to Maximize Student Development Program; Todd Scott, an Extension agent in Campbell County; and John Benner, an Extension agent in Augusta County. I had the pleasure of attending the Minorities in Agriculture, Natural Resources, and Related Sciences 30th Annual Career Fair and Training Conference in Houston, Texas, on March 26 – 28. The Department of Agricultural, Leadership, and Community Education and the Multicultural Academic Opportunities Program at Virginia Tech were kind enough to provide me with funding for travel and conference registration. While I have been a member of MANRRS for 10 years, this was the first time that I had an opportunity to attend a conference in quite a while. While I was at the conference, I was able to make meaningful connections with other underrepresented students in the field of agriculture. I had an opportunity to present in an oral research competition and I found a renewed commitment for the organization. MANRRS is a great opportunity to meet people that have interests that are both similar to yours and drastically different. Over the years that I have attended this conference, I have had the opportunity to meet a variety of professionals in different careers. This has given me a new perspective on the field and the various disciplines included within. 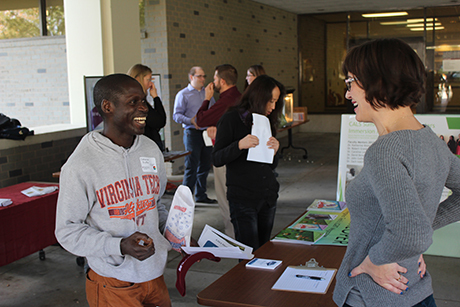 As I was assisting with recruiting at the career fair, I had the opportunity to speak with undergraduate students from a variety of fields about the possibilities that a graduate education at Virginia Tech can provide. It was a wonderful opportunity to both provide information and learn from the people I was talking to. Arlington County may just be one locality in the heavily populated area of Northern Virginia, but this relatively small spot of land that borders the District of Columbia is home to a population that hails from all regions of the globe including Asia, Central and South America, Africa, and the Middle East. 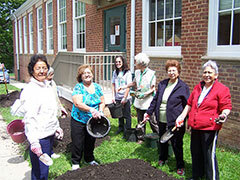 In addition, many residents of Arlington County are classified as having low English proficiency, so unifying this diverse population through Extension programming can be challenging. Agriculture and Natural Resources Extension Agent Kristen Buhls thought a garden could be the key to creating cohesion in a community with disparate ethnic and socioeconomic backgrounds. “My purpose in planting a garden of herbs that were used in the ethnic traditions of these groups of people was to create a teaching tool to increase volunteer and visitor appreciation of horticultural diversity, and also to establish a way for immigrants to see that the plants of their gastronomic traditions could be grown successfully here,” said Buhls.